So many stencils and markers!! 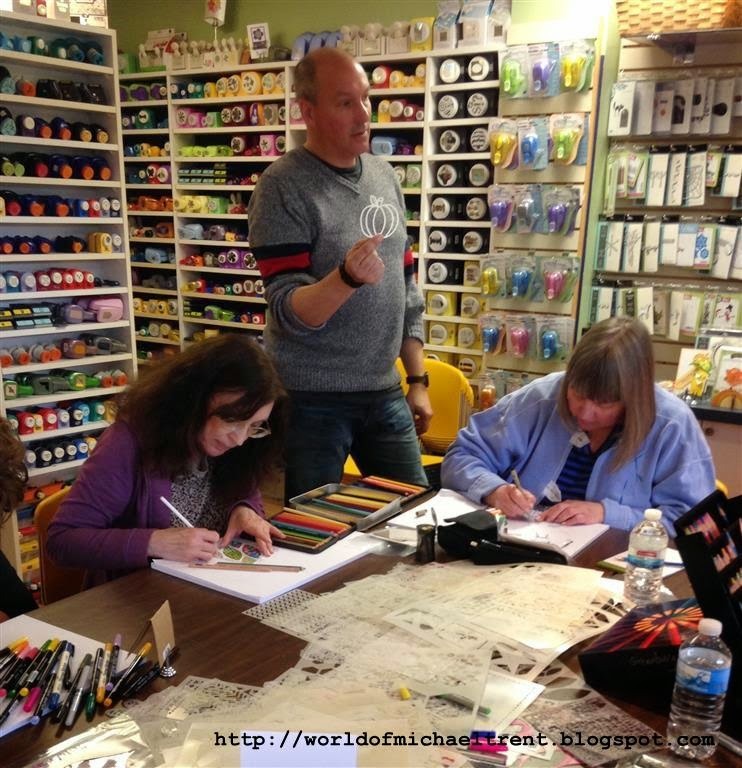 This weekend I taught some classes at Great American Stamp Store in Westport, CT. The morning class was an Intro to StenDoodle class and the afternoon class was a Memory Box Holiday Card class. We had so much fun. I was very lucky that my BFF Sue drove me up there, hung out while I gave the classes and then drove us back. I did not ask her to do this but when I mentioned to her that I was going to take the train, she almost slapped me. Of course the StenDoodle class was a very quiet one because everyone just zones and zens out while doing this technique. For this class we made an ATC and 4.5" card using Art Squares from Inchie Arts (my new favorite product). I really think everyone loved it and everyone made different and fun cards. This is me talking about what to look for in a stencil when doing StenDoodle. Below is a photo of Judy. She and her daughter Jaime own and run the store. If you have never been here, it is a must if you are in the area or are planning a road trip. Everyone working hard. You could hear a pin drop! Here are some of the creations everyone made. Unfortunately, I forgot to take any photos of the afternoon class. I know...bad! But it was a nice class. I even had one person in the class who had never made a card before. Now to prepare for my classes at the Ink Pad in NYC this Tuesday and Saturday! Have You Ever Seen A StenDoodled Elephant From Marrakech? 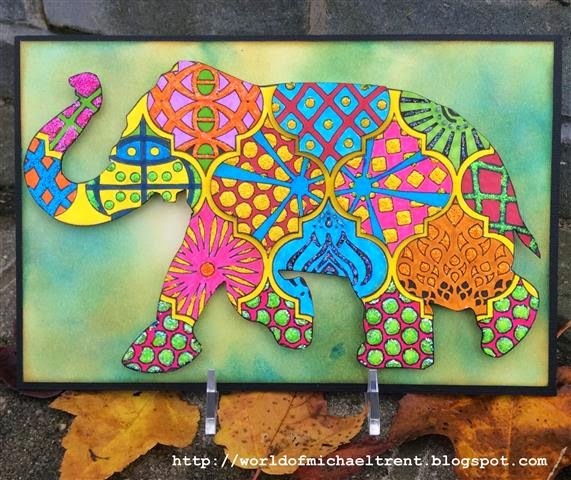 This stencil called "Elephant Parade" is part of Nathalie Kalbach's newest release for StencilGirl Products. When I first saw the stencil online, this is the project that immediately jumped into my head and I had to get my hands on it. I am thrilled with how it came out and hope you can pop by StencilGirlTalk to see the step by step and show StencilGirl some Love! Card by Lisa Lee of Inchie Arts using StenDoodle with stamps! I have recently become friends with Lisa Lee, the owner of Inchie Arts, which is a company that makes Art Squares. 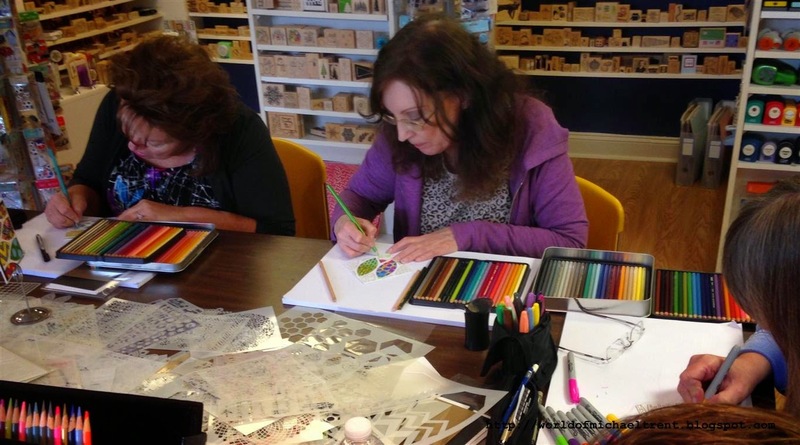 Art Squares are 4-ply mat board that you can pretty much use for anything! You can use it with dry or wet products - use with sprays, texture pastes, inks, markers, paints, pen and pencil. Just about anything! It does not warp and keeps it's shape. I am in love with these Art Squares. They also come in several colors (although I am partial to white since I add so much color) and they start at 1" squares and go up to 4" squares. 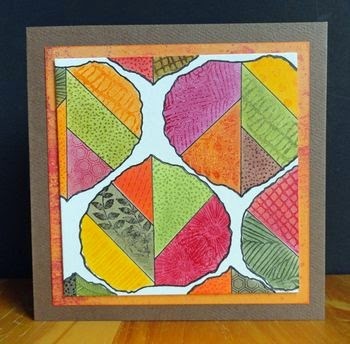 Today Inchie Arts is participating in a blog with CardMaker Magazine and one of the projects that Lisa does uses a 4" Art Square with a twist on my StenDoodle technique. Hope you guys can show some love, check out the blogs, and leave comments!! There is also a giveaway to win some Art Squares of your own to try! Hugs from New York City! Hi everyone. 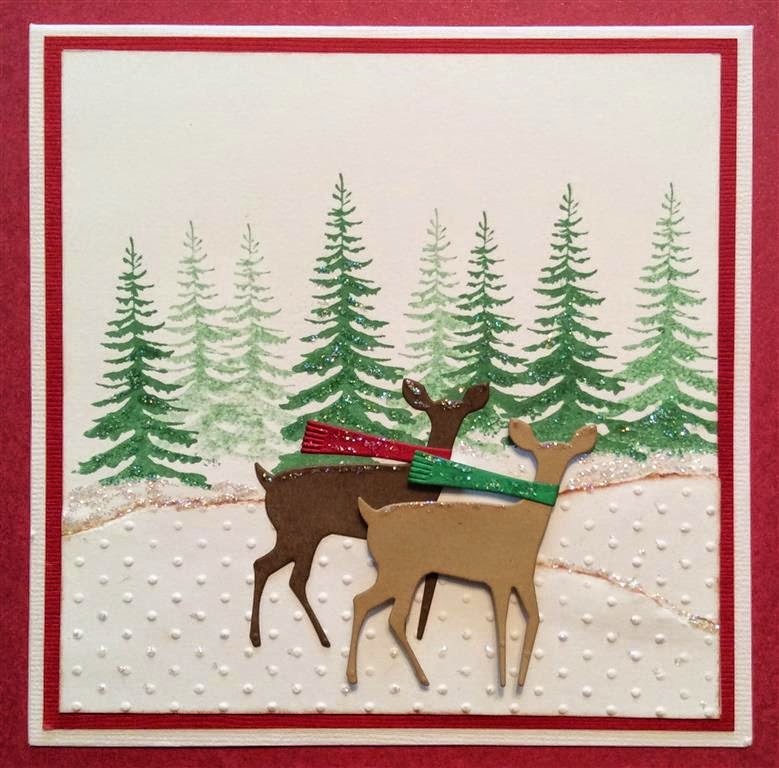 I have been lucky to have some stores ask me to do some classes for Holiday Cards using Memory Box dies and stamps. All the info is below and I really hope some of you can join me in this fun and easy class! Join me as I show you how to make 4 (maybe 5 depending on time) Holiday Cards using dies and stamps from Memory Box . The above card is one of 4. You know that NOW is the time to get started and once you take this class, you will be able to make dozens in very little time. All you need to bring is double sided tape or a glue stick, and a Zig 2 Way Glue with the Chisel Tip. To join me, call one of the stores below to reserve you spot! Exciting News!! My Upcoming StenDoodle™/Stencil Classes in NY, NJ and CT!!! I will be giving several classes using stencils and on my StenDoodle™ technique. I will be stores in NYC, CT, and NJ. all the class info is listed below. I really hope many of you can join me in one of my classes....they will be a lot of fun and filled with color! This is an introduction class to the StenDoodle™ technique I have created. I will explain how my technique came about, give many tips to making sure you projects come out perfect each time, and then we will create 2 6" x 6" pieces of art using 1 stencil from Crafter's Workship and the rest of the stencils will be from StencilGirl Products. All you need to bring to class is a permanent fine tip black marker such as a Sharpie, Copic Multiliner, Micron, etc. 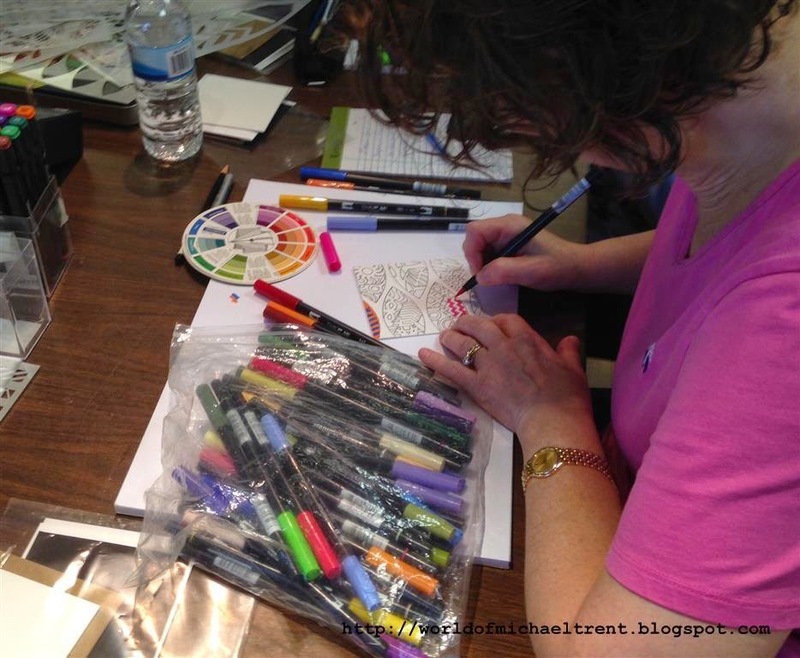 And you will need to bring your own coloring agents such as markers, colored pencils, watercolor pencils, or Copics. Please note...if you plan to use Copic markers, you will NEED to use a Copic Multiliner for the project. This class is at The Ink Pad in New York City. Saturday, October 25, 2014 from 7:00pm to 9:30pm. To register for the class, please call the store directly at 212.463.9876. 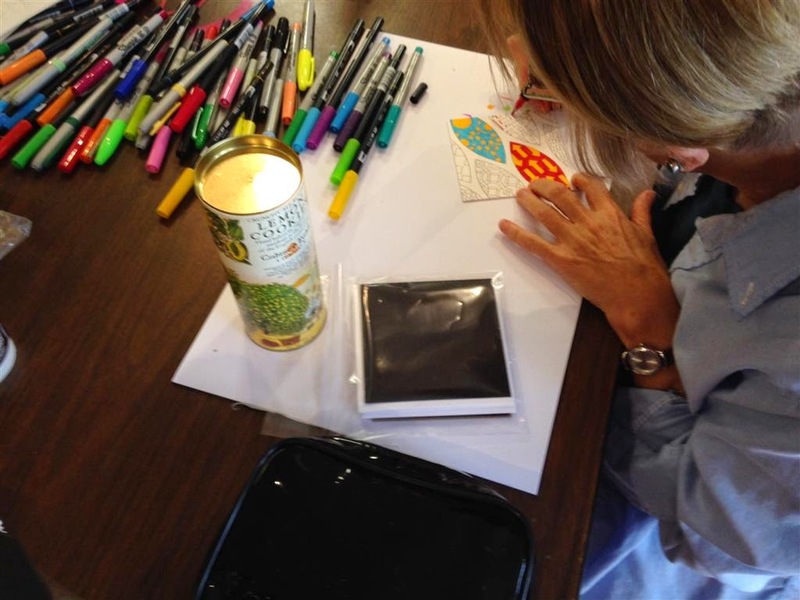 Do you buy stencils just to use on journal pages or in mixed media work? Well there are other ways to use your stencils. Join me as I show you ways to use parts of some amazing stencils by Jessica Sporn and mix them up with others to make great StenDoodle™ projects. Tuesday, October 28, 2014 from 7:00pm to 9:30pm. 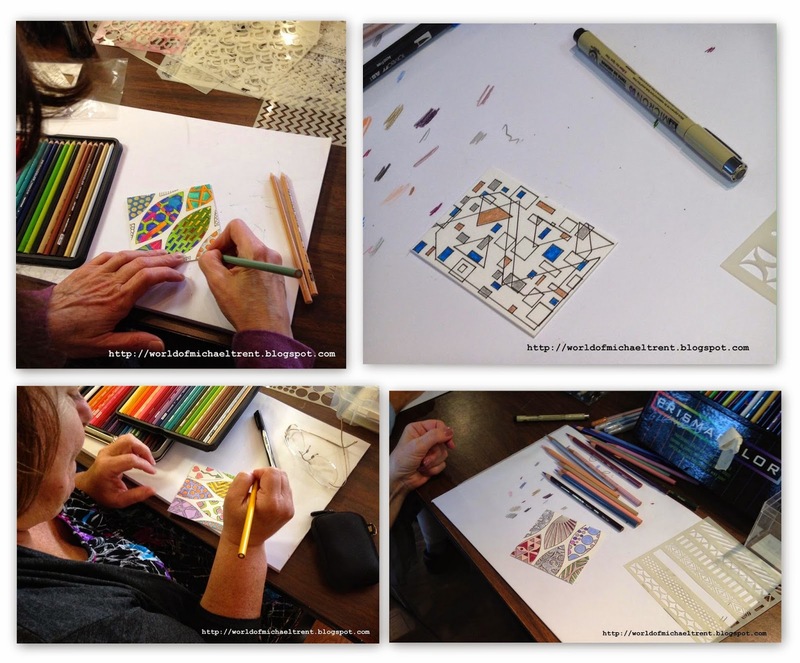 In this class I will introduce you to the art of StenDoodle™ using a 4 x 4 and an ATC Inchie from Lisa Lee of Inchie Arts. Saturday, October 18, 2014 from 10:15 am to 12:15 pm. To register for the class, please call the store directly at 203-221-1229. This is an introduction class to the StenDoodle™ technique I have created. I will explain how my technique came about, give many tips to making sure you projects come out perfect each time, and then we will create 3 pieces of art..one 6" x 6", the other a 4.5" x 4.5" and an ATC piece, using a variety of stencils from The Crafter's Workshop. Friday, November 7, 2014 from 6:00pm to 9:00pm. To register for the class, please call the store directly at 973.927.1210.